The four Lok Sabha members named in the MPLADS scam got the benefit of the doubt from a parliamentary committee probe as there was lack of clinching evidence to show that they had accepted money for recommending the release of money under their respective MPLADS funds. Should there be a special law against witnesses turning hostile? 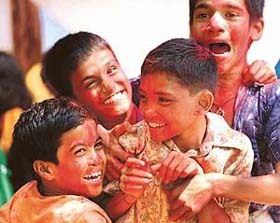 The offices of The Tribune will remain closed today on account of Holi. There will, therefore, be no update of the site on March 16. The Tribune wishes its readers a happy and colourful Holi. Russia has acceded to India’s request and agreed to supply a limited amount of uranium fuel for Tarapur nuclear power plant, the Ministry of External Affairs said today. Moscow’s decision comes days ahead of Russian Prime Minister Mikhail E Fradkov’s two-day India visit, beginning on March 16. Responding to a query of a young Muslim businessman the 300-year-old Islamic seminary, the Darul-Ifta Firangai Mahal issued a 'fatwa' against terrorists targeting places of worship and killing innocent people. After putting up with the skyrocketing price of liquor in the past couple of years, consumers in Punjab will now get their liquor and beer at a price which is 25 to 30 per cent lower than the prevailing price. Haryana’s new excise policy, which has dispensed with the auction system, has met with a good response. Almost 95 per cent of the vends of Indian made foreign liquor have received more than one application. I am very sorry to say that the contents of this report have come out in papers. This is gross breach of privilege. I hope that in the future, all of us will be more circumspect in this matter. Normal life in the hill state was disrupted as snow and rain continued to lash the region for the third consecutive day today. The entire tribal belt of Lahaul-Spiti and Kinnaur, Churdhar, Dhauladhar, Rohtang Pass and other higher reaches are having incessant snow. The Hatu peak recorded 30 cm of snow followed by Dhundi 20 cm and Patsio 25 cm. Allegations and counter-allegations by political parties on ‘‘Khalistan’’ issue ruled the roost on the second day of Hola Mohalla here today. Leaders of various political parties came here to address the political conferences. The President of the Punjab Pradesh Congress Committee, Mr Shamsher Singh Dullo, blamed the Akali Dal (Badal) for raking up ‘‘Khalistan’’ issue in the state while Parkash Singh Badal accused the Congress of creating an atmosphere of insecurity among the people of the state by false propaganda. 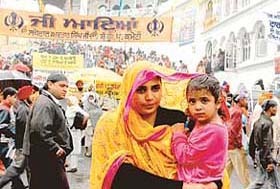 Raining devotion: The late-winter rain is no dampener as devotees throng Keshgarh Sahib Gurdwara in Anandpur Sahib during Hola Mohalla on Tuesday.